Prequel movies are tricky since they start already constrained by the movies that chronologically follow it. It's a weird place to try to write yourself into as it's definitely a case when continuity becomes a lot more important. But a lot of times prequels have particular goals in mind in terms of aspects of the movie franchise that it wasts to explore. When the news of Solo: A Star Wars Story came out, a lot of eyebrows went up. As much as Han Solo is a much beloved character, it's not like a lot of us wanted a prequel set before the core Star Wars trilogy. There is a lot of Legends material that tried to talk about this early years but it's not like we had a LOT of books and comics that focused on this part of his life. 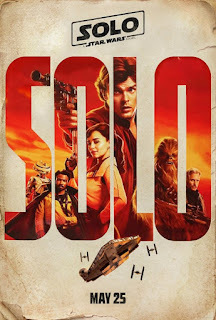 Solo is an odd beast that is fun in its own right but it certainly stands well apart from the other movies as it lacks that sort of grander mission pushing the story forward. This is a more "ground level" story that is about Han and his life and not necessarily about the expansion of the early Empire or even the beginings of the Rebellion. Synopsis: Solo: A Star Wars Story is a 2018 spin-off movie for the Star Wars franchise directed by Ron Howard after original directors Phil Lord and Christopher Miller left project. The screenplay was written by Jonathan and Lawrence Kasdan. On the ship-building world of Corellia we are introduced to Han (Alden Ehrenreich) and Qi'ra (Emilia Clarke) who have been forced by circumstances to work for the gang of Lady Proxima (Linda Hunt). Anb effort to escape their life of criminal slavery results in only Han getting past the guards of Coronet City and Qi'ra getting recaptured by the gang. In order to get offworld and learn to fly, he ends up enlisting for the Imperial Navy. We join him three years later where he's an Imperial infantryman given he was kicked out of the Imperial Flight Academy for insubordination. There meets Tobias Becket (Woody Harrelson) and his wife Val (Thandie Newton) posing as Imperial officers amid the chaos on the planet. His group of thieves is only there for a job and Han tries to get Tobias to bring him along. He ends up getting thrown into a pit with "the beast" who turns out to be a very angry Wookiee (Joonas Suotamo). What I Liked: As a big fan of the old Legends stories and one who is still invested in the current Expanded Universe canon including the animated shows like The Clone Wars and Rebels, I was happy with how this movie had so many nods and winks in our direction. Some reviewers have joked that the movie at times feels like a Wikipedia article given all the references but it's not like I feel these took away from the story for folks not as invested in the franchise. But these additions and mentions certainly added a bit more fun at least. Donald Glover was amazing as Lando Calrissian and he made sure to play homage to how he was originally portrayed in the older movies but still gave things his own spin. He was as charming and smooth-talking as we'd expect out of Lando but also quite vulnerable and funny and prone to reaching too far, which is how he tends to get into trouble. The overall story was okay but not ground-breaking but it's a decent way to further flesh out Han Solo's backstory. I super loved L3-37 (Phoebe Waller-Bridge) and it seems that Star Wars is doing a much better job of giving us rich robot characters in these spin-off movies. And that Kessel run was a lot of fun and a decent explanation for that one silly line from A New Hope. What Could Have Been Better: The movie goes into a lot of those classic prequel problems of trying to "explain" or give origins to so many different aspects of the character. I'm talking about things like Han receiving his iconic blaster in this movie as was show in the trailers and other such efforts to explain this or that fact about him. It goes into a lot of this throughout the movie and I really didn't need it. The movie doesn't have a true villain despite our now creepy "vision" that is Paul Bettany's Dryden Vos as they're all basically criminals and scoundrels. And the stakes stay at the level of Han and his fellow thieves so it's not like they're going to save the galaxy here. And it's not even a true heist movie since it didn't feel like they had truly elabote plans for their jobs or even specialized roles that we typically associate with heists. And the movie also feels like a bit of a miss in terms of not showing more how Han became the highly jaded and cynical rogue he was in the later movies as he still ends things on a fairly positive note. 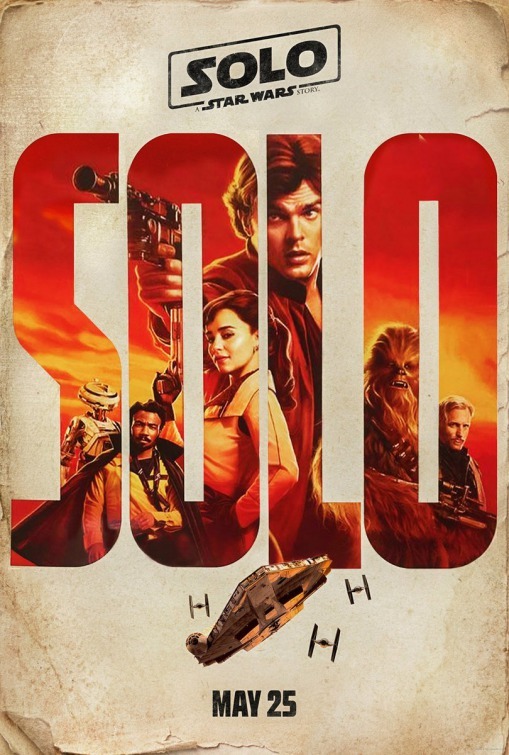 TL;DR: Solo: A Star Wars Story is a very different Star Wars movie in terms of tone but it nicely adds to the overal movie universe in its own way. It's a lot more fun for fans who are more invested in the lore beyond the movies but it's still a decent romp for more casual fans. Thus the movie gets 3.5 ways that Donald Glover made us fall in love with Lando even more out of a posible 5.